Freshwater fishing (angling) in Croatia is regulated by the Freshwater Fishing Law (Croatian Official Papers – „Narodne novine“, No. 106/01, 7/03, 174/04, 10/05 and 49/05), as well as the Freshwater Fishing Act (Sub-law-„Narodne novine“, No. 82/05, 1/06 and 139/06). Anglers buy angling licenses valid for particular fishing area or fishing zone from owners of the fishing rights. These licenses are valid for the particular fishing zone and for some fishing zones of other nearby owners of the fishing right (if there are reciprocity contracts made). There are 120 owners of the fishing right in Croatia, although there are cca. 450 sports fishing associations active. – one year (yearly license). Daily license is valid 24 hours from the hour of purchasing on the date which is written in the license. Yearly license is valid from 00, 00 hours January the 1st until 24,00 hours December the 31st in calendar year written in the license. Yearly license for Croatian and foreign female citizens from 15 and more years as well as Croatian and foreign citizens from 15 – 18 years costs 200,00 kunas. Yearly license for Croatian and foreign citizens from 19 and more years costs 400,00 kunas. Yearly license for Croatian war invalids costs 400,00 kunas. Yearly license for Croatian and foreign citizens from 18 and more years who do not want to be members of clubs costs 800,00 kunas. – 250,00 kunas for angling on fishing zone Otočac (river Gacka). Owner of the fishing right sell yearly license to Croatian and foreign citizen on the base of fishing exam certificate. Foreign citizens have to show this certificate issued in their home country to the representative of the fishing right owner before buying the fishing license. If there is no such certificate, foreign angler has to pass this exam in Croatia. Owner of the fishing right sells the daily license to Croatian and foreign citizens without fishing exam certificate. Sports fishing-angling is allowed with most three (3) fishing rods with one hook, exceptionally artificial bait which can have more than one hook, most two. Sports fishing-angling on all the salmonid species is allowed with one fishing rod and one artificial fly or bait. 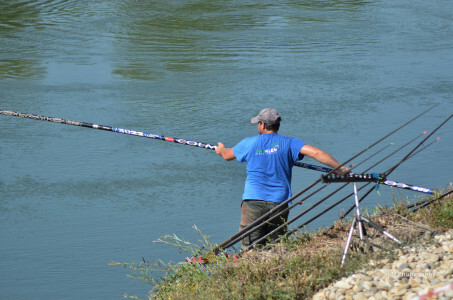 Angling of wels from the boat is allowed with one wels attractant (in Croatian: „buckalo“), one fishing rod or fishing lure with one hook. Fishing rods and fishing gear must be under constant immediate attention of the angler. Artificial bait can have most two hooks (single-hook, doublehook or threehook) with or without contra-hook. Artificial bait-fly can have only one hook with or without contra-hook. The size of the artificial bait for angling of huchen (Danube salmon) and marble trout could not be less than 18 cm. WARNING: Except common fishing regulations mentioned above, every owner of the fishing right has it’s own internal regulations (daily allowed catch in kilogram’s or pieces, night fishing, etc) based on verified fisheries management studies and yearly plans, as well as other internal financial regulations regarding membership. We wish you good catch and nice angling vacations in Croatia !! !